Rhode Island Totaug and Blackfish Fishing Charters (a.k.a. Totaug, Tataug, and totog). 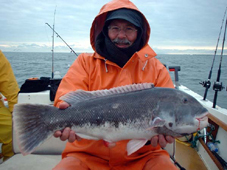 Join us Charter Fishing for Tautog in Rhode Island for an incredible saltwater excursion. 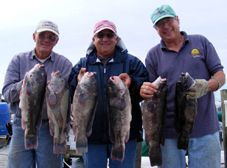 You will have an exciting time on the charter boat Adventure fishing for Tautog along the Narragansett shoreline. The Tautog is a great sport fish but frequently suffers the indignity of misspelling as Tautag, Totaug, Tataug, or even totog. The name is a term used in New England, originally coined by the Narragansett Indians. In the rest of the US, they are known simply as Blackfish. It is an ugly-looking, dark colored fish that lives on rocky bottom and feeds on green crabs, fiddler crabs, clams, mussels, sandworms and lobsters. Tautog are probably the best fighting bottom fish in New England. They are very tough and sneaky as well, making them a real challenge to catch at times but very rewarding when you bring a big one up to the boat. Tautog are a bottom-dwelling fish and to catch them it is necessary to anchor the boat over the rocky bottom that tautog like. We use braided line for tautog fishing, the added sensitivity allows our clients to feel them biting much better than monofilament line. This increases the catch and lowers the learning curve for the angler. We also know all the Tautog fishing hot spots. When a Tautog bites, it can be very aggressive or extremely light. Some of the largest fish will often have the lightest bite, so sensitivity is extremely important. When you lift the rod to set the hook, be ready to put pressure on the fish and start reeling quickly to get him away from the rocks. Then the battle is on as the fish exerts its utmost to get back to its rocky lair. 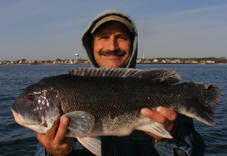 We can fish for tautog May 1st - 31st, then again starting in mid-October until the end of November. Many excellent battles occur during this time. For anyone who has caught bass, you will find a 10lb tautog will fight better than any 30lb bass. Many of these fish are caught during the season, it is not unusual to limit out on many of our trips. 15 or 20 keepers is a slow day. The best bait for tautog is crabs. When the season approaches we put out our crab traps in anticipation. A typical trip uses close to 5 gallons of crabs, so it's important for us to catch a lot of them. We offer half day and full day trips for tautog, leaving from Jim’s Dock in RI. Jim’s Dock is the closest marina to the RI South shore, Narragansett shoreline, and Block Island. Regulations allow for 3 Tautog per person in April, May, July, August, September and October up until around October 16th, then it changes to 6 fish per person through December 15th. It is closed all other months. We will fillet and clean any fish before you leave the dock. As always, Adventure encourages clients to keep only the Tautog they want, and release the rest. October 31, 2011: 9lb Tautog. A trip which limited out. October 31 2011 Tautog Report: Had 2 guys, caught 47 tautog with 15 keepers in 2 hours of fishing, easily limiting out.